This Art Deco armchair is a classical piece of English art deco furniture. 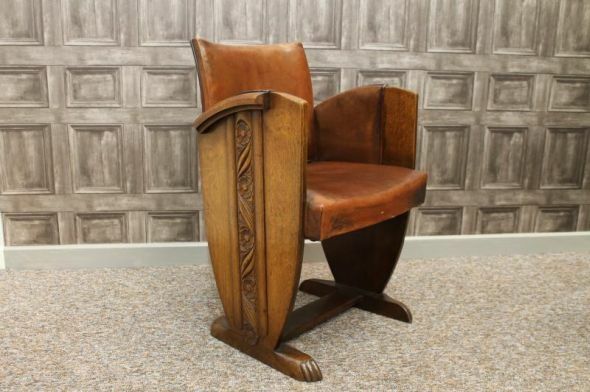 This traditional solid oak and leather art deco armchair made in the 1930s would be ideal for any hallway. It would also make a lovely office desk. This deco armchair is in excellent condition for its age, with just a small amount of wear and tear. Ideal for any period property, or to complement any stylish contemporary interior. We stock a wide range of antique furniture which would complement this stunning leather and oak armchair. Please see our other listings for further information, or contact us on 01543 375872.